The beautiful 2019 exploration game Sable, showcased at an indie event near E3. E3, a show in which the future of gaming pretends to be in the present, is in the past. Those demos that may or may not represent the final quality of the games they preview? All locked up. The previews and round-ups by writers who hit reasonable deadlines? Published. And then there’s me, straggling along. I did see some games. I’d like to tell you about them, okay? I’m only on item two and already I’m rethinking my decision to describe these games in the order I saw them, because here again I must plead ignorance. Not only do I not play Smash (I prefer single player games, folks), but I’m not an anime person. But I know how Kotaku staffers and readers feel about Naruto and Light, characters whose names I know from seeing them exclaimed in our group chat during the Jump Force trailer debut, so as soon as I spotted this game at an Xbox One showcase, I beelined to it. (I am, after all, the Kotaku readers’ humble servant.) I found a Namco rep to play it for me, filmed it with my iPhone (no direct feed allowed), zapped the footage back to NYC and left the anime experts of Kotaku to judge if this three-on-three anime fighting game lives up to the hype promised by the famous fighters it features. This is not the best shot for showing the humans vs/ robots shooter action in Generation Zero, but it is a shot that I requested from the studio because I thought it’d be fun to show everyone what it looks like to wield a boom box in a first-person shooter. You can drop it in-world as it plays music to distract enemies. See more action-packed shots here. I got a behind-closed doors look at Generation Zero, a self-published game from Avalanche Studios (Just Cause, Mad Max) coming to Xbox One, PS4 and PC next year. It’s a scrappy, sprawling first-person game for one to four players and is set in an alternate-timeline 1980s Sweden where people are at war with robots. On their Steam page, the developers call it an “explosive game of cat and mouse set in a vast open world.” In the demo, one of the key features shown involved pinpointing parts of robots to affect their behavior. For example, you blind them by shooting their optic sensors, or hobble them with a hit to their hydraulics. The game leans heavily on its 80s setting. For example, players can wield a boom box and set it up near enemies while it plays music to cause a distraction, a classic pastime known full well to anyone who grew up in that decade. The Division 2, captured from my playthrough of the game’s E3 demo as a few other reporters and I tried to take back control of a wrecked Air Force One. I saw this one under a veil of secrecy a few hours before Ubisoft’s press conference, though a trailer had debuted at the Xbox event the day before. During this session, the producer who had served up a spiel about the game before our hands-on time called the assembled press “Agents,” as if we were characters in the game. The reps kept reiterating an odd but telling promise of a satisfying post-game (likely because Division 1 was thrashed for having a bad one). I played an enjoyable and refreshingly colorful mission near a crashed Air Force One in co-op with three other reporters, an experience made all the more delightful when two of them, on headsets, realized that, for once, neither was the lone woman in a preview session like this. Donkey Kong tosses Rabbid Cranky in this PR shot of Mario + Rabbids’ new expansion. Several hours after Ubisoft’s press conference, I went back to their game-preview loft and played some of the Donkey Kong expansion for the XCOM-like Mario + Rabbids game. It was fun. And similar to the main game. And is out this week. And we just streamed it. Moving on. Star Fox’s Arwing in action against an enemy in this PR shot from the Switch version of the unexpectedly interesting Starlink. Toy-based games do not interest me. But the flailing fortunes of Star Fox, whose Fox McCloud will be in the Switch version of this game, do. Surprise: this sci-fi interplanetary combat game looks beautiful and vaguely resembles a No Man’s Sky but with planets designed by hand, not procedurally by a computer program—mixed with a toy game. You also don’t even need to buy the toys, since you can get the ships, pilots and parts they unlock digitally at a discount. Is that better than just being able to buy the whole experience for a flat $60? Probably not, but the demo of the game at E3 was impressive enough that I went from not caring to caring. An E3 win for somebody! Skull & Bones, as captured during my playthrough of the game’s E3 demo. The main ship in my sights is controlled by AI, but other player-pirates were sailing nearby. My body was still on East coast time when I finally played Skull & Bones, the sprawling shared-ocean pirate game from Ubisoft. Since this never sinks in, I will repeat: you don’t play on-foot. It’s all ship stuff. You unlock various ships. The game’s sectors of 18th-century Indian Ocean provide a mix of PvE and PvP. It looks great, but I still don’t get how they’re going to fill this game with enough interesting things to do. Won’t it get old fast? Especially if you can’t go out on foot? But they’ve got five studios on this, including my favorite Ubisoft satellite, Ubisoft Sofia (Assassin’s Creed Rogue, the Cyrene area of AC Origins, Origins’ Dead Pharaohs DLC). The main team is Ubisoft Singapore, who did the enjoyable sailing portions of the AC games. Overcooked 2, captured from a quick, frantic co-op session at Nintendo’s booth. Fun co-op cooking game. And levels can transform now, I was told. But, no offense, I went to Nintendo’s booth at E3 hoping to play the new Fire Emblem. It wasn’t at the show. Official imagery of the new Let’s Go Pokémon game. The kid on the right is using the game’s surprisingly comfortable optional Pokéball controller. I tried this oh-so-briefly, just to get a feel for the optional Pokeball controller that will be sold alongside the game in November. 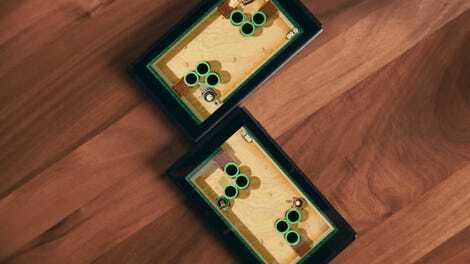 You hold the ball in one hand, using the nub on the little circle as the control stick, and a pressable area under your pointer finger as an action button. To catch Pokémon you gesture as if you’re throwing the controller, but for better or worse, you don’t actually throw it. So much for realism and historical accuracy, huh? This was hands-off, eyes-on. I watched the game’s creative director Neil Druckmann play the game’s E3 demo, the same one shown during Sony’s E3 press conference. This is a third-person action game with some extreme close-quarters violence. When the demo ended, I was told I could speak to Druckmann before the hour. I waited for other reporters to do their interviews. Waited some more. Discovered the Smash Bros. Ultimate footage I’d captured in the Nintendo booth right before playing Overcooked didn’t upload correctly, rushed out to the press room, re-uploaded, rushed back to Sony’s booth, got to Druckmann and had a 10-minute chat about how the game’s enemies have gotten smarter for the sequel, the consequences of having a jump button and the intent of the game’s intense violence. Phew! This demo too was hands-off, eyes-on. Creative director Nate Fox talked about this samurai action game from Sucker Punch, the Sly Cooper and Infamous studio that’s been working on this game since 2014. They’ve at least got a slick, beautiful E3 demo out of it and hopefully a fun game, too. I’ve enjoyed the airy feel of bounding through Sucker Punch’s earlier games and am eager to play something new from them, even if this one seems more grounded. Fox and I spoke afterward about creative influences, the value of tension leading into video game combat situations, the extent to which he’d checked if the Assassin’s Creed people were also working on a feudal Japan game (“no”) and the extent to which he sweated over it (“bullets”). I watched the director of this Switch-exclusive mech combat game play while we had a really interesting conversation about the game and about technology and… I’m going to write it up in another article. Stay tuned. Here, the Signature E3 Experience: In a small room in the middle of the sprawling Square Enix booth, one of the game’s lead writers, Jill Murray, who has written for some of the most interesting Assassin’s Creed games, gave a mostly canned demo of a video capture of a playthrough of parts of the game. She showed off some promising but impossible to judge features, like the game’s hidden Mayan city where Lara Croft can apparently learn to deal with people in non-violent ways in between the standard tomb raiding and stealthy murdering. And then, when the presentation was over, we were able to play the game’s E3 demo, which looks slick and similar to the preceding game in the series, Rise of the Tomb Raider, such that the main feeling I left with was: yes, this feels as great as the old one... but it’s also possibly just more of the old one... and I don’t know if that’s fine, or if we need more... or if this game in fact has more, but that that’s not what they wanted to highlight at E3... so I guess I’m fine and I’ll go to my next E3 demo now. P.S. You can pet the llamas. Sort of. This game was one of two games in a room at the very chill and largely game-free Take Two Interactive booth. And, yes, I know it’s a game from last year and from another publisher. Take that up with Take Two. In the evening, I attended the Indie Mix event, which usually showcases a batch of upcoming games from small and self-publishers and offers a nice flipside to the big-budget games that dominate the show. In The King’s Bird, you leap, build energy as you fall, then use that energy to turn your fall into an ascent that can continue until you hit another surface and reset yourself to jump and start the cycle anew. The result is a flowing side-scroller that I wanted to love but that was too punishing for me. The Indie Mix event was on the roof of a building that was about a dozen stories high. There’s a pool up there, and this game was next to it. Everything Is Going To Be Ok! is a collection of partially interactive vignettes about coping with difficulty, most (all?) featuring an odd rabbit-like creature to whom some very bad things happen. Not the easiest game to grasp after a long day of E3. It’s out on itch.io, and you don’t even have to play it on a roof or near a pool or while sleep-deprived from covering E3. I watched but did not play this minimalist real-time-strategy game that wowed me when it showed up in a Nintendo Direct. Bad North looks so cool and it’s out later this summer on Switch, other consoles, PC and mobile. I lingered in front of Bad North just long enough for its publisher to encourage me to watch a trailer for another game they’re putting out. He brought it up on his phone, and once I looked suitably impressed, he smoothly mentioned that he had a build of the game on a laptop hidden behind the set-up for Bad North. 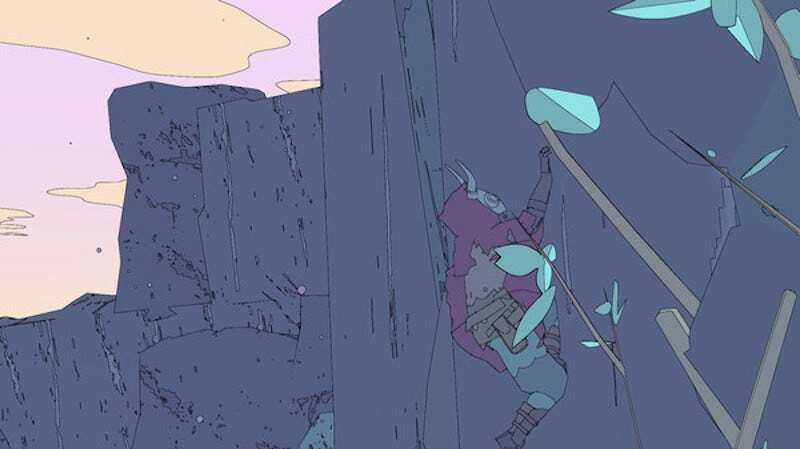 Sable is an upcoming console and PC indie game with art in the style of the great French comic book artist Moebius. What I played was enchanting and non-violent, with the protagonist riding her futuristic hover bike through a desert and into a temple, where I solved some puzzles. The game’s performance was very rough, but that’s no red flag for an indie being made by a team of only two full-timers and not slated for release for at least another year. I watched a Sony publishing guy try to figure out a level of Where The Bees Make Honey, an isometric puzzle game that’s all about rotating levels so that shifts in perspective make new passageways available. You’ll get this better by watching a trailer. Anyway, I got through the level that stumped the Sony man. Yay me! I’m a sucker for perspective games like Super Paper Mario, Fez and more, so I’d love to play more of this once it is out. A Superhot-inspired level from What The Golf? What The Golf is a barrage of golf-inspired challenges slated for a PC release later this summer. You try to shoot a ball into a hole. Then you try to shoot a golfer into a hole. Then you shoot a skidding car around like it’s a golf ball. It got weirder and weirder and more and more fun, until I got to the level inspired by the game Superhot and just kept failing. In Superhot, when you move, the people shooting bullets at you move as do the bullets they’re firing at you. Stay still and everything freezes. In this game’s Superhot level, when you set the ball in motion, bullets being fired at your ball also move toward it. It was tough, I was tired, and after playing it I wrapped up at Mix and called it a night. Hitman 2, captured from my playthrough of the game’s E3 demo. The developers point to the ability to hide in crowds as one of the new options available in the sequel. As Agent 47, I snuck through a Miami raceway, disguised myself as a member of a pit crew and planted a bomb on a race car. Hitman 2 will not be episodic like the last one. It will still have good outfits. It was another of those more-of-what-was-good-last-time E3 demos. It took me a minute to get what the deal is with Lego DC Super-Villains. Yes, it’s yet another Lego game, but this time you’re bringing a custom character along, slowly unlocking superpowers for them, creating your own villain. Fine, although I think I’d rather focus my time controlling Lex Luthor, Solomon Grundy or Cheetah. The screen showing the number of unlockable characters was full of mystery icons. Let’s hope one of those is for The Quiz, the old Doom Patrol villain with the best superpower ever: Every Power You Haven’t Thought Of. Sure, I like my Last Of Uses and God of Wars and Horizons, but I’ve also always cherished the part of Sony that’ll put out an Echochrome or Puppeteer. Concrete Genie is another one of those smaller games from a particularly small and young team that wanted to make a game about a boy who paints magical monsters into virtual life on walls while coping with local bullies. It’s beautiful and easy to root for, though I’m not yet convinced it’ll have a sufficiently satisfying gameplay loop. I hope it does, because I like to see first-parties back games like this. Shame on me for missing my first appointment to see the new game from Remedy, the studio behind of Max Payne, Alan Wake and Quantum Break. Shame on me twice for being late to the rescheduled appointment. But on the third try, I was glad I didn’t miss seeing a game that makes good use of the slowed-down firefights that the studio pioneered, mixed with anti-gravity powers and topsy-turvy set-ups in a massive building full of surprise encounters. I didn’t fully get what our hero Jesse Faden will be up to, but I trust Remedy to deliver satisfying action and a weird narrative. The game is slated for release next year on PS4, Xbox One and PC, but who was that knocking on the door to check the game out after my demo session ended? Why, it was Nintendo of America president Reggie Fils-Aime and a crew of other Nintendo employees! It’s not uncommon for platform-holders to check out a wide range of games at E3, but how could I not mention that? An official photo showing how one of Super Mario Party’s two-screen games can be played. Players can drive tanks from one screen into the next. I wasn’t allowed to play it, but I did manage to get a private demo of Super Mario Party’s clever multi-screen mini-games. Experimental and weird Nintendo is the best Nintendo. Official artwork for Beyond Good & Evil 2's version of original BG&E hero Jade. Catch a glimpse of gameplay from the game, which is still rough and very early, in this clip from Ubisoft’s E3 press conference. I saw the fabled sci-fi adventure Beyond Good & Evil 2 at last year’s E3 when it was little more than a rough tech demo showcasing the ability to zoom out from hovering over a city, to high in the atmosphere, then to outer space and beyond. At this year’s E3, once again behind closed doors, the developers played a more involved game that still has a long way to go. They showed some combat, emphasizing that the game will be playable in two-player co-op, then some hoverbike racing amid airborne traffic in the build’s futuristic city. After some hoverbike dogfighting, they showed off the zoom-out thing all the way into outer space. Had I not seen the zoom thing a year ago, I’d have been excited. The game’s lore is interesting. Before the playable stuff, two developers detailed BG&E2’s themes about predestined class-restricted clones and the rebellious lifestyle of those who break free to become space pirates. The promise is that, as space pirates and with all this on- and off-planet gameplay potential, we’ll have an epic sci-adventure. I can’t tell how a game with the vast scope of letting players hop from planet to planet is going to come together. They’ve got time, but it still seems to be in early stages, even after all these years. This demo felt mostly like reassurance that, yes, they’re still making it. Notably, while the demo room was full of developers, Michel Ancel—the developer most associated with BG&E—was not there. They said he’s still working on it, though. After Beyond Good & Evil 2, I went to the press room. Time to wind it down? Nope. With fifteen minutes of E3 left to go, I bolted back out to the show floor to see if I could find more games. In an indie gaming area near Sony’s booth, I found Kaisuo, a student game that plays out like a Room-style puzzle game in which you’re unlocking locked things, but in life-size first-person VR. The officially-licensed Replicade version of Centipede. That tiny trackball works. So there’s this game where you control this little thing that shoots from the bottom of the screen while a centipede descends from the top of the screen and wiggles its way down mushrooms or something. You control it with a trackpad. Heard of it? The version I tried played on a mini arcade cabinet that is one-foot tall. Assassin’s Creed Odyssey, as captured from my playthrough of the game’s E3 demo. If we loop all the way back to about two weeks before E3, I saw Assassin’s Creed Odyssey in advance of the show and published absurdly detailed impressions during the show. Couldn’t leave that out!